Vertigo Comics is an imprint built on horror titles like Swamp Thing and The Sandman, so it’s no surprise that it’s most recent wave of new series went heavy on the horror elements. 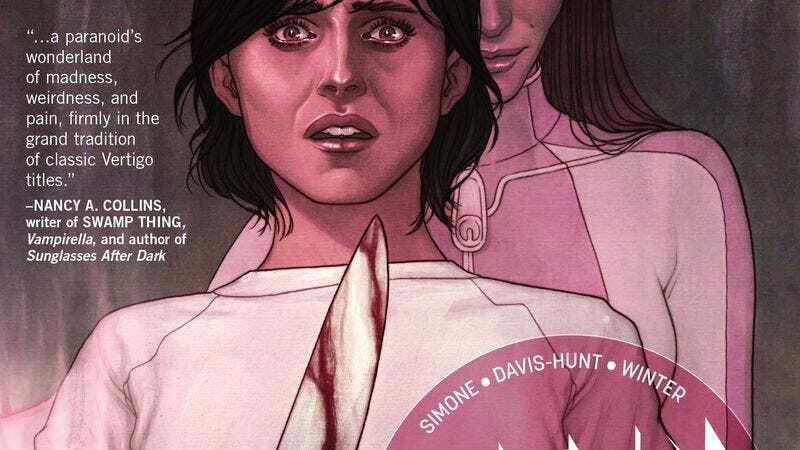 When it comes to creating frightening moments, no new Vertigo books have been as successful as writer Gail Simone, artist Jon Davis-Hunt, and colorist Quinton Winter’s Clean Room, a thriller that takes inspiration from Scientology for a story about manipulation, belief, and using people’s deepest fears against them. Astrid Mueller is the L. Ron Hubbard-esque leader of a new religion/cult that serves some of the Hollywood elite, but she actually has the ability to see the demonic parasites that latch onto people in this world, parasites that are making a more forceful play for possession. Clean Room reaches the finale of its first arc with this week’s issue #6, and these preview pages show multiple story threads converging as the character’s deal with the fallout of Mueller’s actions. The most important thread is the one exploring why Chloe Pierce’s husband killed himself, one of big lingering mysteries of the book thus far, and Chloe discovers this information in a two-page spread that shows the creative team’s talent for breaking down moments into individual beats that build tension by stretching out the passage of time. These pages also highlight Davis-Hunt’s deep understanding of character expressions and body language, which amplify the emotional beats of Simone’s script. There’s a lot of clear craft that has gone into making Clean Room an impactful horror series, and knowing Simone’s writing, the terror will only intensify as the series continues.